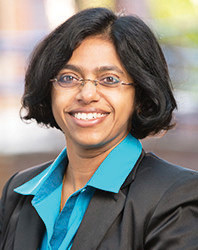 The research of Dr Anju Vasudevan, from the Department of Psychiatry at Harvard Medical School and McLean Hospital, focusses on the early development of blood vessels in the brain and how defects in this process may be associated with a diagnosis of neuropsychiatric disorders, such as autism, epilepsy, schizophrenia, and depression after birth. Her work paves the way for innovative new therapies targeting blood vessel development in the field of psychiatry. One in four people in the USA and internationally suffers from some form of neuropsychiatric illness during their life. Similar statistics are reported in the UK. Whilst drugs and other therapies exist to treat some of the symptoms, there are no cures for the underlying causes of neuropsychiatric illnesses. Understanding the responsible mechanisms, and therefore the opportunities for novel therapeutic strategies, underpins the research of Dr Anju Vasudevan and her group at Harvard Medical School and McLean Hospital. In particular, they investigate the novel roles of blood vessels in the brain and how defective development of brain vascular networks can contribute to neuropsychiatric disorders. Whilst blood vessel abnormalities typically come to mind in relation to blood pressure, cancer or stroke, mental health disorders are rarely considered in this context. Gamma-aminobutyric acid, more commonly known as GABA, is a well-known factor in the development of the brain and nervous system. It serves as an excitatory neurotransmitter before birth and as an inhibitory neurotransmitter after birth. GABA is released by a particular group of neurons, the GABAergic interneurons that are found in the cerebral cortex of the brain. The cerebral cortex is the largest region of the brain and is associated with cognitive function (e.g., memory and attention) and consciousness. Abnormalities in GABAergic interneurons have been linked to the development of autism, epilepsy, anxiety, depression, and schizophrenia. 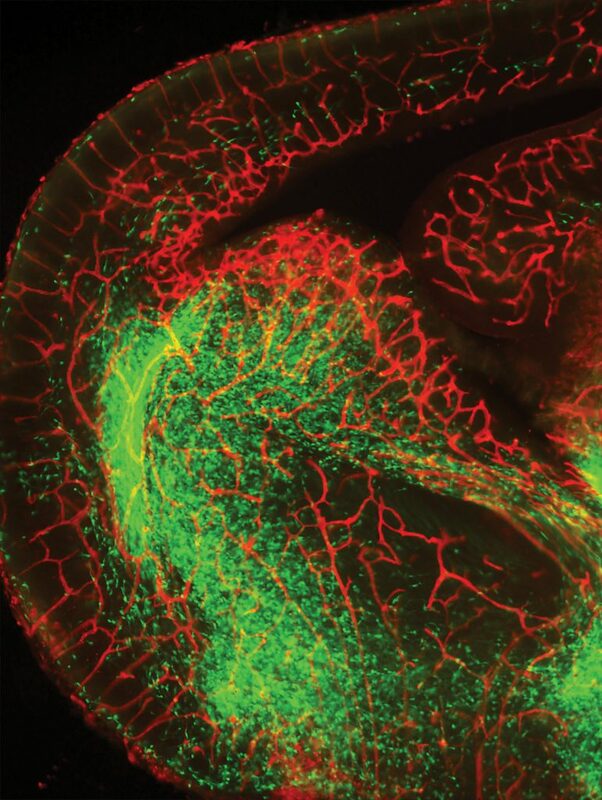 It has been previously shown that abnormal brain development in the early embryonic phase is also linked to these disorders and therefore, GABA-mediated signalling during development has been extensively studied over decades. In addition, an age-related decline in the amount of GABA in the brain is associated with neurodegenerative diseases and a decrease in cognitive function. Dr Vasudevan’s work emphasises that brain development is not just determined by neuronal signalling, but that development of the associated blood vessels is critical. It focusses on the process of angiogenesis, the development of new blood vessels. Dr Vasudevan has identified different populations of blood vessels in the brain: pial and periventricular. These differ in their origin, gene expression profile, and developmental mechanisms. The periventricular vascular network is of specific interest here as it emerges ahead of neurons and provides vital guidance to processes that follow during brain development, for instance, neurogenesis – the generation of new neurons and neuronal migration. Dr Vasudevan has shown that immature neurons rely on guidance from periventricular vessels to migrate from the region of their birth to the place in the mature brain where they carry out their functions. Indeed, genes believed to be involved in neurogenesis and neuronal migration are also found in periventricular endothelial cells (the cells that line the interior surface of blood vessels and are the ‘building blocks’ of blood vessels). Interestingly, several genes previously believed to be confined to only GABAergic interneurons are prominent in forebrain endothelial cells compared to other regions of the brain. This key evidence has opened new doors for studying the role of vascular GABA signalling with respect to psychiatric disorders. Predominantly, this indicates that multiple pathways in both neuronal and endothelial cells may co-exist in patients with psychiatric illnesses, making it crucial to understand the interactions between the different cell types and independent pathways in each cell type. Delineating this process in careful detail underpins the research focus of Dr Vasudevan. Recent studies in Dr Vasudevan’s laboratory reveals how interfering with GABA release by endothelial cells in an animal model, results in dysfunctional behaviour similar to that seen in psychiatric diseases, including impaired social interactions, depression, anxiety, and reduced communication. It highlights how important vascular GABA is for shaping angiogenesis, neurogenesis, and neuronal migration during prenatal brain development. This has huge implications for the way that neuropsychiatric illness is approached, suggesting that instead of adopting only a neuronal perspective, understanding the defects within cerebral endothelial cells is of critical importance. A major limitation until now for studying the vascular GABA pathway was unavailability of proper mouse models. Only complete or region-specific knockouts of GABAA receptors and GABA signalling components were available and these were not specific to different cell types. Dr Vasudevan and her colleagues have created two new mouse models to overcome this problem. 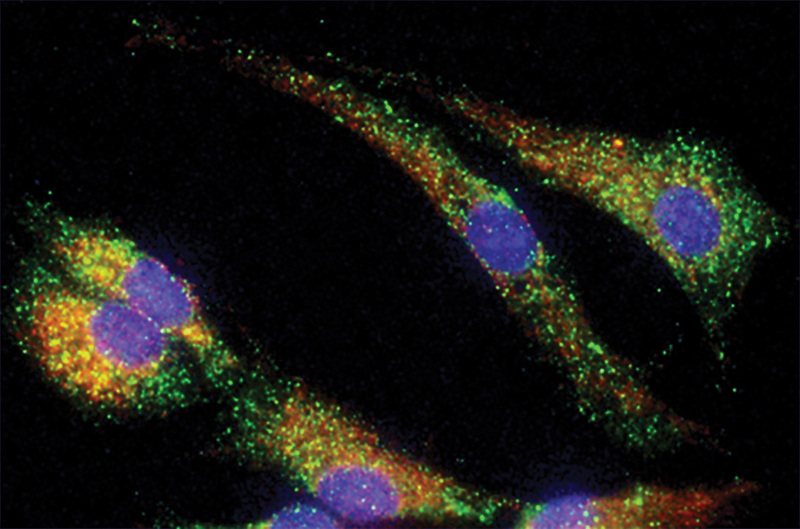 The first mouse model specifically blocks GABA release from endothelial cells and the second contains dysfunctional GABA receptors in endothelial cells. With the use of these models, it will be possible to study how the vascular GABA pathway controls angiogenesis, neurovascular interactions, vessel function, and complex psychiatric behaviours. 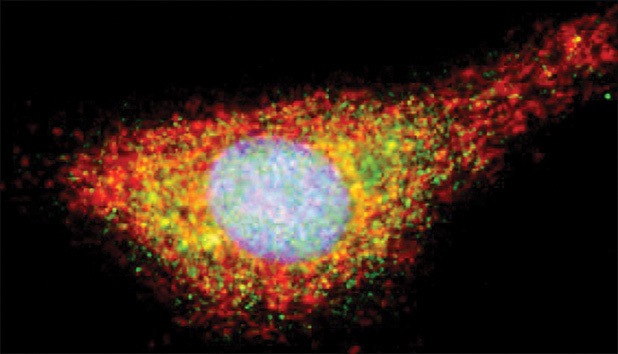 In addition to their work on GABA, Dr Vasudevan and her colleagues have studied another molecule that plays an important role on brain development. Vascular endothelial growth factor (VEGF) is a protein that is indispensable for angiogenesis. Hitherto, it was generally believed that neurons, and the cells that go on to develop into neurons, are the principal source of VEGF that binds to receptors expressed on endothelial cells in order to drive angiogenesis. But deletion of vascular endothelial growth factor exclusively from endothelial cells resulted in an abnormal increase in proliferation of neurons and altered neuronal migration during brain development illustrating the importance of vascular VEGF. Whilst it is not yet clear how this protein may be linked to psychiatric disorders, recent studies in Dr Vasudevan’s laboratory show that the endothelial VEGF signalling pathway may be either under direct control or actively interacting with the endothelial GABA signalling pathway. Further work is expected to elucidate an alternative therapeutic target. 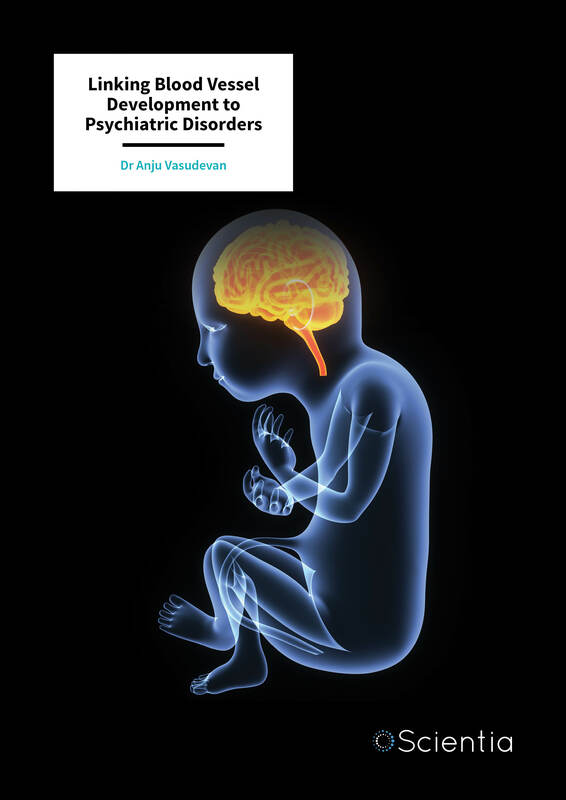 The ultimate aim of Dr Vasudevan’s work is to open new avenues for treatment, based on a thorough understanding of the origin and mechanisms of psychiatric disease. Her work has already demonstrated that variation in endothelial GABA levels during embryonic brain development can explain some of the diversity seen in psychiatric disease symptoms. There are two sides to her approach; the first explores the prenatal brain and the second considers the adult brain. In terms of the brain before birth, Dr Vasudevan is currently investigating whether pro-angiogenic compounds can be used to save neurovascular interactions during a critical window in prenatal brain development and whether in doing so, it may be possible to ameliorate postnatal behavioural symptoms. In the adult brain, cell transplantation may offer the possibility to introduce a novel source of vascular GABA to rescue the neural circuits in the diseased brain. In order for this transplantation process to work, Dr Vasudevan stipulates that the cells must be able to disperse efficiently from the site of administration to the site of activity. They must be able to fully differentiate into mature neurons, and they must be able to integrate into the existing neural machinery. So far, studies have shown that transplanted cells can take several long months to disperse through affected areas. This is where the discovery by Dr Vasudevan and her group is so important. Using the pre-formed vascular networks in adults would allow the natural transport of GABAergic neurons in the diseased brain along with stabilised GABA release. The group at McLean Hospital have successfully generated endothelial cells derived from human stem cells and are using these to co-transplant human GABAergic neurons into a mouse model. If this approach does decrease the time it takes for the transplanted neuronal cells to disperse in the brain, this is a major step forwards in the advancement of endothelial-neuron based therapy to a clinical setting. The research of Dr Vasudevan and her group will continue to isolate and study new components of the vascular GABA signalling pathway in the embryonic, postnatal, and adult brain. 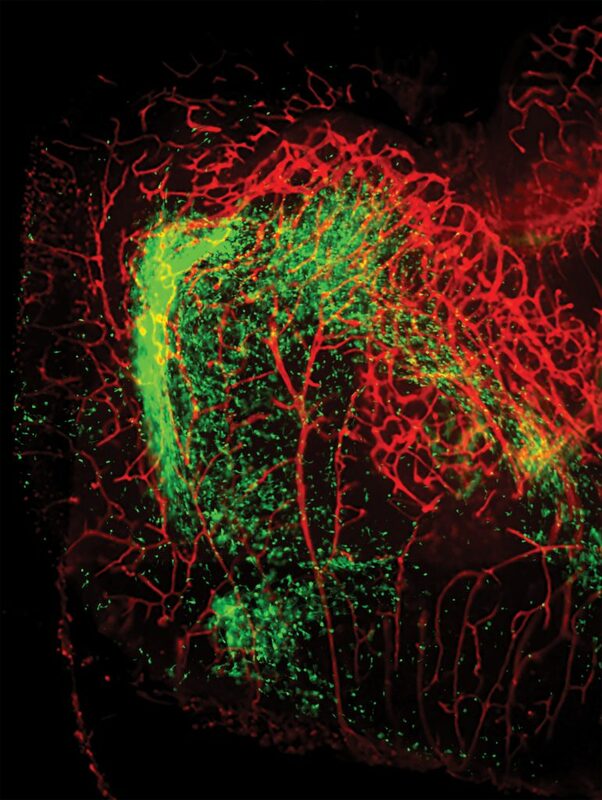 They plan to use innovative approaches to harness the potential of blood vessels to heal the diseased brain. As more pieces of the puzzle are solved, the chances of developing effective treatments for neuropsychiatric disorders improve study by study. GABA has been referred to as a ‘phoenix’ that appears amidst renewed enthusiasm, only to fade away and be reignited after a time. Hopefully the work of Dr Vasudevan will prevent this elusive molecule from fading into the ashes and will go on to improve the outcome for those patients who suffer from psychiatric disorders. Dr Anju Vasudevan obtained her PhD in neuroscience at the University of Cologne in 2004. She then held post-doctoral and junior faculty positions at Massachusetts General Hospital/Harvard Medical School before setting up and becoming the Director of the Angiogenesis and Brain Development Laboratory at McLean Hospital in 2011. She is currently an Assistant Professor of Psychiatry at Harvard Medical School and Associate Neuroscientist at McLean Hospital. Dr Vasudevan’s research centres on mechanisms that define the formation of new blood vessels in the central nervous system, and how these influence key events involved with brain development and behaviour. Defects related to the formation of blood vessels at the earliest stages of development may play a role in the emergence of neuropsychiatric disorders in childhood and later in life; therefore, this work has major implications for understanding disorders such as autism, epilepsy, schizophrenia, and depression. Dr Vasudevan is an established neuroscientist with an impressive publication and funding record. S Li, KT Peeyush, S Joshee, T Kirschstein, S Subburaju, JS Khalili, J Kloepper, C Du, A Elkhal, G Szabó, RK Jain, R Köhling, A Vasudevan, Endothelial cell-derived GABA signalling modulates neuronal migration and postnatal behaviour, Cell Research-Nature, 2018, 28(2), 221–248. S Li, K Haigh, JJ Haigh, A Vasudevan, Endothelial VEGF sculpts cortical cytoarchitecture, The Journal of Neuroscience, 2013, 33(37), 14809–15. C Won, Z Lin, KT Peeyush, S Li, L Ding, A Elkhal, G Szabo, A Vasudevan, Autonomous vascular networks synchronise GABA neuron migration in the embryonic forebrain, Nature Communications, 2013, 4, 2149. A Vasudevan, JE Long, JE Crandall, JLR Rubenstein, PG Bhide, Compartment-specific transcription factors orchestrate angiogenesis gradients in the embryonic brain, Nature Neuroscience, 2008, 11(4), 429–39.